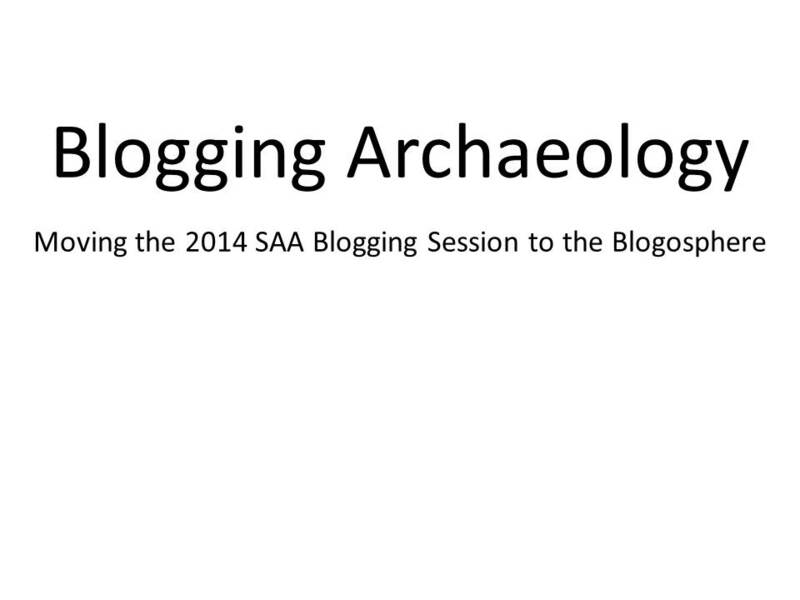 At this year’s SAA conference there is going to be an amazing Blogging in Archaeology session. It has been a few years since there has been one. Unfortunately, I won’t be able to attend the session and I know a couple of other archaeology bloggers who can’t either. My way of contributing is to widen the participation by hosting a blogging carnival (what’s a blogging carnival, click here) on archaeology and blogging. This was done for the last blogging session by Colleen and this is inspired by her work. Each month leading up to the SAAs I will post a question. If you would like to answer this question, blog about it. Tell us your thoughts and opinions. Please steal the banner above, and link back to this post (wordpress alerts me to links). Also, email me (drocksmacqueen@gmail.com) or post the link in the comments (either here or the post with the questions on it). This is so I know about your post and can link to it. At the end of the month, I will summarize all of the post and add links so that folks can find them all in one place. Hopefully, this will allow us to highlight some great archaeology blogs. EDIT– Kelly asked- ‘Is there any obligation to take part every month?’ Absolutely not, take part as many or as few times as you want. If there is a question you really like, blog about it. If it does not particularly interest you, wait till the next month. It is all up to you. EDIT– You do not have to be interested in going to the SAAs or an American to participate. We want everyone who blogs or who are interested in blogging to participate, regardless of geographic location. We have a twitter hashtag- #blogarch please use it for the carnival and SAA session. Thanks. Chris Webster, who is running the SAA session on Blogging that inspired this conference, and I are putting together an e-book of papers on Blogging and Archaeology. Those who will be giving papers in April at the SAAs will be contributing and Chris has been kind enough to open it up to anyone, including those of us not attending. We have a publisher lined up and the e-book will be Open Access so everyone can read it. Style- write in whatever style you want, 1st person casual or 3rd person academic it does not matter. British English, American English, German, etc. it does not matter but please stay consistent. It can be on any subject related to Archaeology and Blogging. It can be a full referenced examination of a topic or a personal narrative. It can be a photo essay too. There is no limitation to how you write your piece. Also, Colleen Morgan is putting together a special peer reviewed issue of Internet Archaeology on Archaeology and Blogging. For more information about the dedicated issue of Internet Archaeology, please contact Colleen Morgan (colleen.morgan@york.ac.uk) by 10 Feb. That date is key as spaces for the IA issue are limited and Colleen needs to know if you are interested right away. Those papers need to follow IA standards and how to write for IA can be found here. So what does the e-book and IA special issue have to do with the carnival? Well this months question is open. That is you can blog about any subject you want relating to Archaeology and Blogging, Blogging Archaeology, Archaeology Blogging, or however you want to term it. The reason for this is because throughout the carnival many of you have mentioned using a blog as a way to work through your thoughts, some on the way to writing longer pieces. We are hoping that you might want to blog about a subject that you would then turn into a piece for the e-book or IA issue i.e. Blog post to e-book chapter to peer-reviewed journal article. Please, please blog about the past months questions. We only do it my months to move the carnival forward but there is nothing to stop you from blogging previous questions. Blog and send me the link and I will add you to the final post. The theme is the good, the bad, and the ugly of blogging. Blog about one or all of these themes. Instructions on how to participate can be found here. New to Blogging? Now I know some of the participants have only been blogging for a few weeks and PLEASE join in. You may not have had any good or bad experiences but we would love to hear about your hopes and dreams/ concerns and nightmares about your future blogging experiences. The idea is that these are general themes to guide you. Looking through the different responses to the last set of questions I see a huge range in how people responded. Please respond to these themes however you want. I will be collecting up the responses on January 3rd and do this all over again. Please link your responses to Decembers questions to this post/comment there or email me at drocksmacqueen@gmail.com with your links so I can collect them at the end of the month. Is actually two and half questions, feel free to answer one or both. Why blogging? – Why did you, or if it was a group- the group, start a blog? Feel free to take this an any direction you want. I realize that lots of people have already done a post like this (still please post the link here or send me the link if you have already blogged about this). So in case you don’t want to write this post again here is a second(ish) question. (Again, still send me the link or post it below). Why are you still blogging?- Some prompting question along those lines: Have the reasons why changed since you first started blogging? Are there new reasons why you blog? Now I am know I am asking a lot here but the flip to that question is- Why have you stopped blogging? I know there are lots of bloggers out there who have stopped blogging regularly or at all. It would be great to hear the reasons why. The irony of asking people who stopped blogging to blog about why they stopped is not lost on me. But if you are willing to share through one last post or maybe send me an email that I can re-post here, please? PS if anyone wants to host one of these monthly sessions drop me a line. This is a fantastic idea. Is there any obligation to take part every month? Absolutely not, take part as many or as few times as you want. If there is a question you really like, blog about it. If it does not particularly interest you, wait till the next month. It is all up to you. I actually just followed it to your post. I am actually on your post right now and a nice thing about WP is it lets me comment back here. Brilliant stuff by the way. Ever thought of presenting your work at an archaeology conference or event? You probably do better public archaeology then most archaeologists. Your reasoning for blogging is superb! Yeah, me too. On a side note but someone related to all this. What was the process to getting to the archaeology of tomb raider? I followed your two other blogs. Actually, I followed your first over to china heritage and now over to tomb raider. I was kind of wondering how/why you moved from blog to blog. Well, my first archaeology blog, The Amateur Archaeologist, proved to be a challenge as it covered too broad a topic…so I decided to focus on Chinese archaeology for a while. I enjoyed working on that one but I ended up losing a lot of my Amateur Archaeologist readership as few of them were interested in Chinese history and heritage issues. It also took too long for me to translate articles for the blog (it was a one-person project and I could no longer fit it around a full-time job and my other hobbies) so I eventually decided to abandon it. As for The Archaeology of Tomb Raider, the blog was something I had had in mind for a few years now but since people had gotten bored of the franchise and I wasn’t sure if fans of the games were interested in archaeology (after all, Lara Croft is a terrible archaeologist), I didn’t pursue it any further. When they released the new game, there was a sudden revival of interest in the Tomb Raider games so I thought it was the perfect time to launch the blog. I’ve had a lot of positive feedback from my readers and I now receive almost daily requests from fans for more information about the places and artworks seen in the games. It seems that it’s easier to establish yourself in the blogosphere if you’re a niche blogger…and I think I may have finally found my niche. Cool, thanks. Always wondered how that happened. I’m not sure how other professionals would act, but I would live to see you at a conference. Perhaps some day a session can be created in which you would feel comfortable, I think you have a great deal to bring to the table in such a way that other people should pay attention especially professionals. Thanks for your kind words, Elizabeth. I agree that a greater public involvement is needed and I’m glad to see that archaeologists and “amateurs” (such as myself) can share our thoughts and ideas via blogs, online forums and social media. Excited to start answering these, and looking forward to the session! That’s a great question, Doug. Apparently, I’m about the only archaeology blogger that hasn’t thought about why I started in the first place. Helping other archaeologists find jobs was my initial goal when I started the Succinct Research blog. I had been reworking other folks’ resumes, but all the cheap skate archaeologists I knew weren’t willing to pay me to do that. But, the archaeologists I helped said they would be willing to pay for a book about resume writing aimed specifically at archaeologists. So, I wrote the book around the time I started the blog. I was going to offer the book for free, but I wanted to see if eBook writing could pay for the website. It can. At some point, I realized the tips and suggestions I was putting on my blog were rarely addressed in the readings and projects we have to do in college. I also realized that there was a massive disconnect between being an actual archaeologist (CRM or academia) and what was being taught in school. In fact, most of what I learned in my BA and MA was useless for the stuff I was doing on the job as a CRMer. That’s when I realized the second goal of my blog: to help spread the kind of information that is really necessary for being an archaeologist. I also realized that I could network with other archaeology bloggers to spread the word to a wider audience. Doug and Chris Webster have been really influential in my blogging career and have helped me reach a wider audience. My current goal is to continue creating stuff that can be used to help archaeologists in their careers. With the blog, I can quickly get the message out in my own way and in my own voice. It’s also an easy way to spread useful information. EBooks are also a great tool because they’re portable and cheap when compared with the huge costs of a paper book created by a huge publishing company. I’m also thinking about creating some trainings and MOOCs in the future, which I will obviously be blogging about. Can’t wait to see what next month’s question is. I post because you asked. I added my response on my tumblr which goes along with my blog HistoryEchoes.wordpress.com . I think this is great and am sad I will probably not make it to SAA. It’s really long (big surprise there…) but great questions! If it helps, I do follow your blog in my archaeology bog rss feed. Thanks for participating. Michigan State U. Campus Archaeology Program http://campusarch.msu.edu/?p=2537 blog post on “Why Blogging?”. I think this is a great idea! Blog carnivals seem to have fallen out of popularity of late -I was just thinking about one we used to do regularly for anthropology called the Four Stone Hearth and wondering what it might take to revive it. I’m in. I think this is a great idea and I’m excited to participate, and to get the chance to learn more about about other people’s blogs and archaeology all over the world. We started our blog earlier this year. The opening post kind of summarises why (http://blog.underoverarch.co.nz/2013/04/i-am-an-archaeologist/). As a bit of context, I’m an archaeologist working on post-earthquake Christchurch (I worked there for about 10 years prior to that as well). The post-eq demolitions mean both a huge loss of heritage for the city, but also the recovery of a lot of archaeological material. I started the blog for a number of reasons: to show people that while we were losing so much of our built heritage, we were also gaining a lot of knowledge; to fulfill the ‘public good’ aspect of archaeology (a blog – & a Facebook page – seemed the best way & easiest to engage quickly with the public); and to show people why archaeology’s important. It’s been a lot of work, but it’s also been really validating. The positive response we get from so many people reaffirms the importance of the work we’re doing, and that people are interested in our recent past. It’s also been a great way of connecting with descendant communities. Alright, I went ahead and wrote a post about why I don’t blog anymore, but want to. I hope someone out there enjoys it! Great, adds a different perspective. I’m not sure if our family blog qualifies as an archaeology blog. But I have noticed that I post a great deal about archaeology, and that if you choose to only look at the archaeology posts I still post more frequently than most other blogs that are exclusive to archaeology. When I am running a dig or survey I post about the project 3 or 4 times a week. Anyway, I guess my point is that I consider my blog an archaeology blog, but it’s not a typical archaeology blog. Or maybe if you just use the blog address with only the archaeological posts linked it is an archaeological blog? And because our blog is more of a family blog – the answers to your questions are a bit different than I’ve seen for other archaeological bloggers. I started to blog because my wife made the blog to record our family life. And that is what it basically does. But we still blog because it is way better than a photo album, and we do print out our blog every year or so. Also it forces us to organize our photos. And it helps us to be better writers. As regards my archaeology posts – I do them because they are a part of my family life. But I have also discovered that they are a form of digital notes. They are my first impression of an ongoing dig. If someone wants to know what we found etc. I usually refer them to my family blog. The museum where I work (the Alutiiq Museum in Kodiak, Alaska) also takes my posts, re works them and re posts them on their website. I have even taken a set of posts and put them together into a ‘preliminary site report’ for the landowner etc. A copy also always gets accessioned with the project notes and collection. Anyway, not sure If I will post on this on my family blog. But I did want to comment as this is a subject that interests me. Great initiative! Just saw it, written my part and paste the link here. It is a blog on theoretical archaeology, bodies and academia- maybe not the traditional archaeology blog. Looking forward to your next questions. Should ping back, but here’s my February entry. Starting to think about topics for the e-book, and on the general subject of blogging the past as a form of public engagement. Enjoy, and let me know what you think.. Thank you for hosting this – it was great fun to take part!